Heading north: BSc Med Hons student Zela Martin will attend the prestigious annual Ecole Polytechnique Fédérale de Lausanne Summer School, Switzerland, designed to improve critical thinking skills, the evaluation of scientific information, experiment design, and the formulation of ideas and test hypotheses. At just 1.6m, poised and slight as a pipette, BSc Medical Honours student Zela Martin doesn’t look much like a weightlifter. That’s not the only surprise about the 24-year-old student who overcame major personal setbacks to make a life in science – and land an international honour. This week Martin will fly the African universities’ flag at the prestigious annual Ecole Polytechnique Fédérale de Lausanne (EPFL) Summer School in Lausanne, Switzerland. Though other African candidates have attended the summer school, she is thought to be the first representative of an African university. Martin, who worked “many jobs” to put herself through high school in KwaZulu Natal, is one of only 25 students chosen from 1 000 applicants from the world’s top universities for the EPFL’s International Summer Research Programme for Life Science Students. “They’re all there, Oxford, Harvard, Imperial College London, Yale, Cornell…” Martin says in the meeting room in the drum-shaped Wolfson Pavilion that links the units of the Institute of Infectious Disease and Molecular Medicine (IIDMM), where she’s based. On Friday 5 July she will write her last mid-year exam and climb on a plane, her first trip abroad. The two-month research programme will give participants hands-on lab experience under the supervision of EPFL faculty in one of its four institutes. She’ll experience what it’s like to be a member of an international research community working at the forefront of science. The timing of the summer school will ensure that she’s able to work on a component of her honours research as part of an existing collaboration between her local supervisor, Dr Digby Warner of the MRC/NHLS/UCT Molecular Mycobacteriology Research Unit (MMRU) and the DST/NRF Centre of Excellence for Biomedical TB Research, and his Swiss partner, Professor John McKinney. The research targets drug tolerance in TB. Little is understood about the mechanisms underlying tolerance, but the bacterial SOS response, which Martin studies, might be involved. The SOS response is a global response to DNA damage in which the cell cycle is arrested to allow for DNA repair and, in some cases, mutagenesis. It’s important to fully characterise its potential contribution to this phenomenon, says Martin. She has inserted mutated genes into a fluorescing strain of Mycobacterium smegmatis, a TB bacillus that is non-pathogenic to humans, thus providing a valuable proof-of-concept for TB research. This strain will be studied further at EPFL by making use of single cell imaging technology that is not yet available in South Africa. Martin’s achievements have come on the back of significant struggles. Due to straitened personal circumstances, matric seemed elusive until a scholarship to a boarding school in Pietermartizburg was provided. Armed with her National Senior Certificate, a rock-hard resolve and little else, she came to work in Cape Town in 2007. Several other jobs saw her through the first years of her undergraduate degree and a switch from a BA to a BSc. The BSc Med Hons bridges the gap between her undergraduate training and a post raduate career in medical research, and is offered jointly by the Departments of Clinical Laboratory Sciences and Human Biology in the Faculty of Health Sciences. 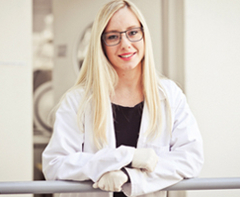 Martin is an IDI student, which means her focus is on infectious diseases and immunology. Thanks to a Harry Crossley Foundation Research Fellowship, as well as funding from the Molecular Mycobacteriology Research Unit, this is the first year Martin has been able to plough all her energies into her studies. Well, not all. There’s the weightlifting. This complements her interests in trail running, hiking and surfing. And it fits with type; Martin has always tackled challenges bigger than herself. Next up will be a PhD, she says, a stepping stone in a path to a career as an internationally competitive researcher.